the Fraternity and Sorority P O L I T I C A L A C T I O N C O M M I T T E E ΑΒΓ Δ Ε Ζ Η Θ Ι Κ Λ Μ Ν Ξ Ο Π Ρ Σ Τ Υ Φ Χ Ψ Ω Spring 2017 Preserving the Greek experience for future generations of student leaders FSPAC Exceeds Cycle Goals Your Contributions Support Overwhelming Wins F raternities and sororities…we make the difference! This message has been key to our communication over the past several months as we have begun our fundraising for the 2017-2018 legislative cycle. This is a time of tremendous action in Washington, D.C., and the Fraternity and Sorority Political Action Committee (FSPAC) is ready and able to support those legislators who work with us on the many issues that affect us and our fraternal organizations. First, a look back and report on how the 2015-2016 cycle finished. What did you help to accomplish? • The FSPAC raised just over $600,000, exceeding our goal for the cycle. • The FSPAC contributed to 109 candidates for the United States Senate and House of Representatives in the 2016 election cycle—101 of whom ultimately stood for election, and 92 won their elections. This cycle, members of 31 fraternities and eight sororities received funding from the FSPAC. Overall, 91% of FSPAC-supported federal candidates won election. • The current 115th Congress has approximately 135 fraternity and sorority alumni/ae. In short, your contributions helped the FSPAC achieve record-breaking results last cycle, your money was used effectively with more than 90% of it going to winning candidates, and fraternity/sorority membership in Congress is holding steady as a result. Looking forward, our 2017-2018 cycle goal is $700,000. Reaching this goal allows the fraternity and sorority voice and perspective to be heard by Congressional candidates. We continue to move forward and strive to protect our rights and the many issues we are working on as described in the legislative report on page 4. The FSPAC leadership board, composed of 54 men and women, met for the fall board meeting last October. During that meeting, it was determined that the FSPAC will engage in a strategic planning effort through a special committee to continue to move this organization forward and to make sure that we maintain our strong impact in Washington, D.C. The special com- mittee has been engaged in the strategic planning process this spring and will finalize the plan with the board in the coming months. There is much on our agenda to continue our fundraising efforts and ensure we continue as a viable and formidable PAC in Washington, fighting for the rights of the fraternal experience for our students and our organizations. My term as president will come to an end on April 30. As I look back since I first joined the board in 2008, I remember the reason why I felt participa- tion in this organization was worthy of my time, talent, and treasure. I am a better person today due to my sorority experience. Through the leadership education, friendship, and philanthropic service we experience as colle- gians or alumnae, we have all become better citizens in this country. We value our fraternal experience. I believe we must preserve the rights of the fraternity and sorority experience so that more young men and women can have the same incredible life-changing experience we have had. I firmly believe that we do MAKE A DIFFERENCE! 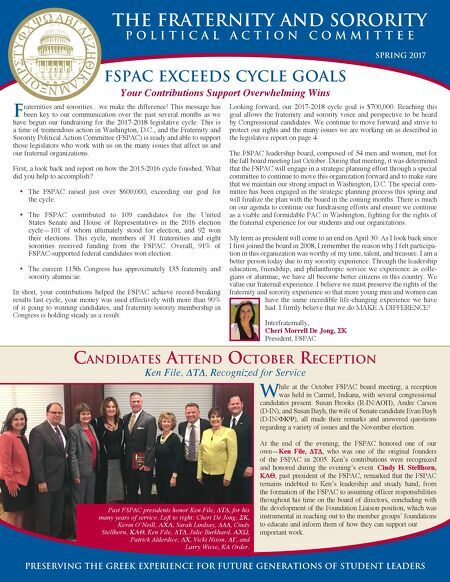 Interfraternally, Cheri Morrell De Jong, ΣΚ President, FSPAC Candidates attend OCtOber reCeptiOn Ken File, ΔΤΔ, Recognized for Service W hile at the October FSPAC board meeting, a reception was held in Carmel, Indiana, with several congressional candidates present. Susan Brooks (R-IN/ΑΟΠ), Andre Carson (D-IN), and Susan Bayh, the wife of Senate candidate Evan Bayh (D-IN/ΦΚΨ), all made their remarks and answered questions regarding a variety of issues and the November election. At the end of the evening, the FSPAC honored one of our own—Ken File, ΔΤΔ, who was one of the original founders of the FSPAC in 2005. Ken's contributions were recognized and honored during the evening's event. Cindy H. Stellhorn, ΚΑΘ, past president of the FSPAC, remarked that the FSPAC remains indebted to Ken's leadership and steady hand, from the formation of the FSPAC to assuming officer responsibilities throughout his time on the board of directors, concluding with the development of the Foundation Liaison position, which was instrumental in reaching out to the member groups' foundations to educate and inform them of how they can support our important work. Past FSPAC presidents honor Ken File, ΔΤΔ, for his many years of service. Left to right: Cheri De Jong, ΣΚ, Kevin O'Neill, ΛΧΑ, Sarah Lindsay, ΔΔΔ, Cindy Stellhorn, ΚΑΘ, Ken File, ΔΤΔ, Julie Burkhard, ΑΧΩ, Patrick Alderdice, ΔΧ, Vicki Nixon, ΔΓ, and Larry Wiese, KA Order.